An estimated 5.4 million Americans were diagnosed with Alzheimer’s disease in 2016 and that number is only expected to grow. Many individuals with Alzheimer’s or dementia move into a memory care facility since they offer specialized treatment and care that cannot always be provided at home. The interior design of these facilities plays a significant role in helping the resident feel safe, happy, and at home. Warner Design Associates applies each of these considerations when providing design for memory care facilities to create a wonderful experience for both the operator and resident. 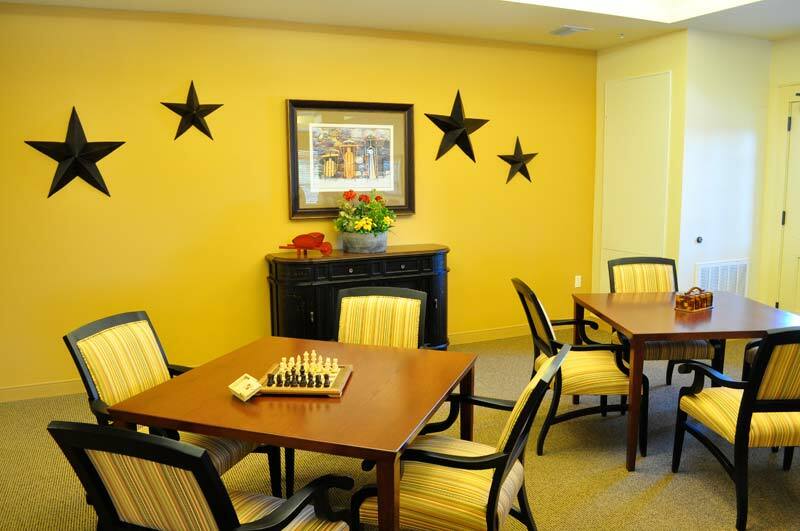 Here are a few elements we suggest taking into consideration when designing the interior of a memory care facility. Many individuals with Alzheimer’s or dementia don’t always recognize or remember where they are, which is why they tend to wander or roam. Therefore, it’s important to make sure that the memory care environment is designed with no dead ends which can both frustrate and scare lost individuals. Many facilities choose to use a figure eight design so that residents who wander will always have somewhere else to go. In addition, many facilities will provide snacks throughout the hallways in case individuals get hungry while they are roaming. To alleviate concerns of residents getting lost, there is a variety of technological advancements to easily monitor residents around the facility. Specially designed memory stations or “themed areas” throughout the facility can help trigger a residents’ memory. Some common themed memory stations or wings include music, fitness, and meal prep. Sensory stimulation elements such as light, color and texture can help reduce behavioral and psychological aspects of Alzheimer’s and dementia. Thus, creating an interior design focused on sensory stimulation is an important component of memory care facilities. To avoid confusion and frustration, we recommend designating specific, contrasting colors to help differentiate planes and rooms throughout the facility. For example, Warner Design Associates ensures the difference between the wall and the floor are easily discernible so the resident does not stub their toes. In addition, we suggest painting the wall behind the toilet a strong contrast color with the toilet in order to make the toilet stand out. Gardens can also provide many benefits to residents by creating an open, natural environment with fresh air thereby making them feel less trapped. Similar to any care facility, the most important aspect of design is to make the resident feel at home. We recommend creating a space that stimulates the mind, invites positivity, and makes the resident feel that they are in a comfortable, familiar place. At Warner Design Associates, we incorporate each of these aspects into the design efforts of memory care facilities so that residents have the best in design, comfort and functionality. View examples in our portfolio.